To restore a Victorian fireplace is not too difficult, but if there is substantial damage or missing parts, then you can also consider a reproduction cast iron fireplace from a company such as Stovax. There are excellent Georgian, Victorian and Edwardian styles available. To replace a tile, you have to remove the fire surround and the grate, so only attempt this if absolutely necessary. Either ignore minor cracks or attempt a discreet repair by wiping PVA or epoxy glue into the crack and use some enamel paint if necessary. If you need to remove the fire surround, look for the fixings. Marble surrounds are usually fixed to the wall with hidden ties covered with plaster. A metal detector may help you find them. Dig into the plaster to free them. Expect the surround to consist of separate pieces; they may fall apart so make sure you have help. Wooden and cast iron surrounds are usually fixed with screws; cast iron surrounds have lugs at the sides. The tiles are normally fixed with a metal frame held on with nuts. Remove the tiles and clean them if you are keeping them. Thinners or paint stripper will remove black lead. Use household bleach to reduce staining where the tile has crazed. Glue broken tiles with PVA or epoxy resin. If the tiles are chipped, make a filler by mixing talcum powder with epoxy resin. Re-assemble the tiles into the frames and bolt these back into the grate. Use slivers of wood to press the tiles into the front of the grate. Fix the tiles in place with plaster of Paris. If the surround is of marble, use fine casting plaster to fix the parts. Cast iron grates and surrounds are safe to strip with chemical paint strippers such as Nitromors, or ideally a poultice stripper. Apply it with a paint scraper or filling knife and an old paint brush to work it into any details. Use rubber gloves to protect your hands. Then wash off the remains of the stripper and dry the grate. Use a wire brush or wool to get rid of the rust - or use rust remover. When you have finished, polish the cast iron with grate polish applied with some old rag, unless you want a burnished effect in which case use a spray such as WD40. Wood is best stripped with a solvent-based stripper, wire wool and stiff brushes. Alkali-based strippers can damage hardwoods. If you think the surround is marble or slate, beware because some marble is simulated with paint on wood or slate. In the Edwardian period, slate surrounds were often decorated with gilding and coloured enamel panels. In any of these circumstances, stripper will damage your fireplace so use with care. Think of the fireplace as an old painting - ie begin with the gentlest chemicals and methods, a small area at a time, and be ready to neutralise, usually with lots of water. And recognise you are taking a risk. Begin on the most hidden area, with meths and 00 grade wire wool. Be very gentle. If that does not take any paint off, try white spirit instead. Only in the last resort use Nitromors or similar, applied with some soft cloth. If you go too far, you can go back to the slate and re-gild where necessary, or try re-enamelling. The cast iron grate is fixed to the brickwork with screws or sometimes with wire loops. If there are no suitable holes, are there any pegs on the back that you could wind one end of the wire round? If so, then create a second loop which you can then set into a little channel in the plaster, and screw to the wall. If there is no peg, you could try Araldite or similar to fix one end of the wire to the cast iron. Use a file to get a clean and rough surface. The hearth is often tiled. Damaged tiles can be repaired in the same way as for cheek tiles. To fix mended or replacement tiles, chip out some of the tile cement to leave room for new adhesive. If this is too hard, glue the tile in with PVA. There are three parts to the hearth; the main underfloor part protects the wooden floor from fire. On top of this hearth sits the hearth under the fire itself. To the front is then a decorative hearth. The main hearth should be a 125mm thick concrete slab. It should extend 500mm or more beyond the front of the chimney breast and a minimum of 150mm to each side of the opening. If you have a solid floor this should be suitable for use as a constructional hearth. Seek advice from the Building Control section of your local authority. The decorative hearth can be in slate, ceramic tiles, brick other stone. It should normally be least 48mm thick and must extend 300mm or more from the front of the fireplace. The back hearth should be a mortar of 4:1 sharp sand and cement, or else a pre-cast slab. It should be the same thickness as the decorative hearth, i.e. flush. Cracks can be filled with fire cement; wire brush the area to remove the soot. Scrape the crack to widen it. Spray the area with water and use a trowel to press the cement into place. 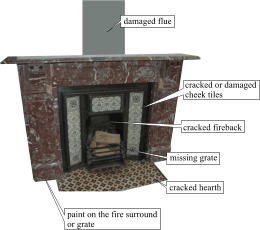 More serious damage will require the removal of the fireplace first. Cast iron can be welded by a blacksmith. With old chimneys, there is a risk that carbon monoxide fumes can leak from the flue into the house in the rooms that the flue passes. The highest risk of this would be in a house with a sooty chimney, which has been capped and with no ventilation at the bottom. For example the fireplace has been blocked in but no air vent fitted. Then you will get a damp chimney; water will penetrate and activate the acid in the soot - which then attacks the lime mortar. Place carbon monoxide detectors near the fireplace and in the rooms above. Monitor them over the next few days when burning coal or wood. You can fit a fire surround yourself. For a wooden surround, fit small metal plates to the back of the surround. Chop a recess into the plaster and then screw the other side into the wall. Plaster over the plates. With marble or slate, the process is more complex. Some of the pieces may need wooden pegs or metal pins to help align them; look for the holes and make the pegs to fit. Fix them in place with fine casting plaster from an art shop. Note that this sets quickly, so mix only as much as you need for each stage. The plaster serves only as an adhesive; the objective is to hold the pieces together but not so strongly that they could not be taken apart in the future. You also need three or four metres of 75mm x 25mm wood as props; you may not need them but have them to hand. You also need screws for the wall, and copper wire or expanded metal mesh. Fix the jambs to the wall first. Put screws into the wall with copper wire ties or else use mesh with plaster. If these fixings have to be outside the jambs, chop some slots in the plaster so they can be covered with plaster. Make sure they are vertical, the tops level and the fronts aligned. Then put the plaster round the bottom of the jambs - from inside. And up the verticals. Again just to hold the pieces together. Next, spread a thin layer of plaster on the tops of the jambs to fix the frieze piece. Repeat with more for the mantelshelf; use some plaster at the back of this to fix it to the wall. You may need to support this with a length of wood to stop it sliding forward. Make sure this is level front-to-back and side-to-side. Wipe off any plaster that has seeped through before it sets.